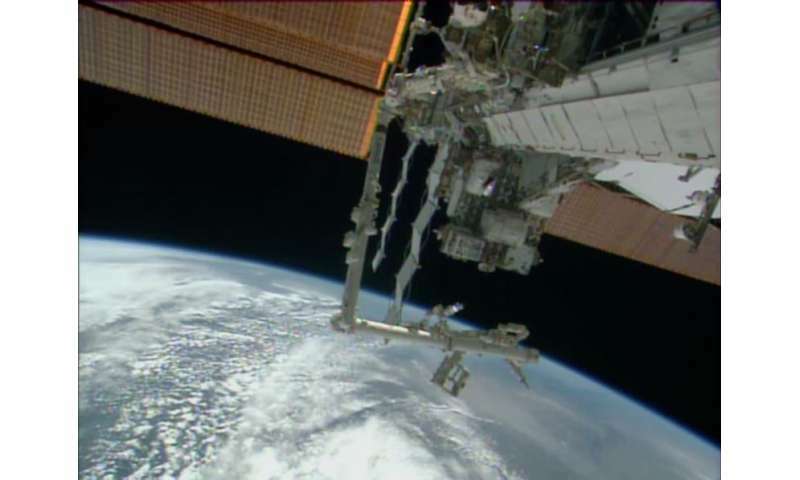 It's back, it's updated, and it's making great progress – all on the International Space Station (ISS). NASA's Robotic Refueling Mission (RRM), a groundbreaking demonstration of new satellite-servicing technologies and techniques, recently resumed operations on the space station after a two-year hiatus. Within five days, the RRM team had outfitted the RRM module with fresh hardware for a series of technology demonstrations and tested a new, multi-capability inspection tool. "The International Space Station is the ultimate test bed for new technologies," explains Benjamin Reed, deputy project manager of the Satellite Servicing Capabilities Office (SSCO) at NASA's Goddard Space Flight Center. "It gives us the opportunity to practice and test technologies in an environment that just cannot be replicated on the ground." Known by its creative team as the "little ISS experiment that could," RRM broke uncharted ground in 2011-2013 with a set of activities that debuted robotic tools and procedures to refuel the propellant tanks of existing satellites. Its second phase of operations, which took place in April and May and will resume again later in 2015, offers something entirely different and just as disruptive, says Reed. "We've outfitted the RRM module with new hardware so we can shift our focus to satellite inspection, instrument life extension, and even techniques for instrument swap-out," says Reed. Such servicing technologies could open new possibilities for owners of spacecraft in low and geosynchronous Earth orbit, he says. Limited options currently exist for satellite owners when the unexpected occurs on orbit. If a solar array fails to deploy, or a micrometeorite strike affects a spacecraft's component, there is typically no way to see the potential cause of the anomaly or the extent of the damage. Even healthy satellites will eventually deplete the valuable commodities that keep them, and their instruments, running at top condition. The SSCO team, the creators of RRM, want to change the status quo. "We envision a future where robots, outfitted with a caddy stocked with tools, can help satellite owners diagnose and deliver timely aid to their spacecraft – ultimately extending their service lives," says Frank Cepollina, veteran leader of the five servicing missions to the Hubble Space Telescope, and current associate director of the Satellite Servicing Capabilities Office. "Each task that RRM demonstrates gives NASA and the fledgling satellite-servicing community the confidence that these capabilities are real, that the technologies are proven, and that they can eventually work on a subsequent mission." The new RRM hardware launched to the ISS in two shipments, on board the Japanese HTV-4 cargo vehicle in August 2013, and the European Automated Transfer Vehicle-5 in August 2014. 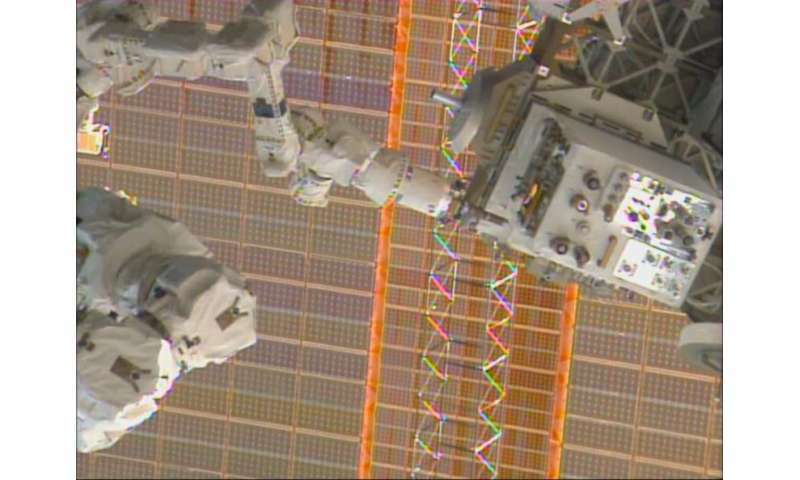 The second phase of RRM activities kicked off in April with the Canadian Space Agency's Dextre robot transferring and installing two new RRM task boards and a tool onto the existing RRM module. From there, the team dove straight into a set of operations that debuted a new, multi-capability inspection tool named VIPIR, the Visual Inspection Poseable Invertebrate Robot. 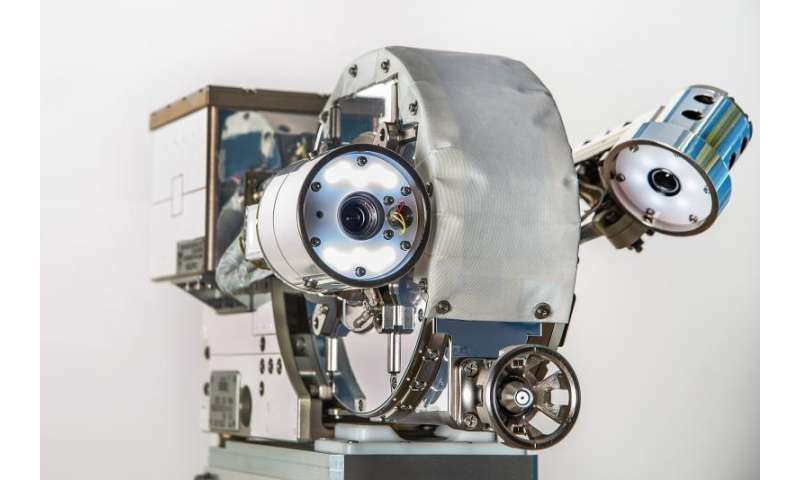 Shiny and silver, with a shape reminiscent of an old-time movie reel projector, the team built VIPIR to test a set of cameras for spacecraft inspection and anomaly diagnosis. "When we asked the satellite community about their needs, we repeatedly heard how valuable an inspection capability could be for insurance companies and satellite manufacturers," says Reed. "Being able to see exactly how or why a component failed on orbit could mean the difference between launching more spacecraft with the same faulty design, or making a fix on the ground assembly line." Robotic inspection capabilities can also be used for routine spacecraft maintenance and anomaly recovery, he explained, potentially saving astronauts from taking a trip into the harsh space environment. To demonstrate a range of inspection capabilities, NASA equipped VIPIR with two unique inspection cameras, as well as a fixed camera that helps human operators on the ground control the tool during operations. On its side, VIPIR holds its workhorse mid-range inspection camera with a miniature, motorized 8-24mm optical zoom lens, about the size of a roll of quarters. This motorized zoom lens (MZL) can resolve worksite details as tiny as 0.02 inch – an area thinner than a credit card – while maintaining a tool distance of a few feet. For close-up inspection jobs, VIPIR also carries a tiny, color, 1.2 mm diameter camera, nestled at the end of a 34-inch deployable video borescope. Operators can command the borescope's tip to articulate up to 90 degrees in four opposing directions. With its miniscule dimensions, this borescope camera is one of the world's tiniest cameras, and is the smallest camera to ever be flown by NASA in space. Developed commercially, it is typically used by the medical industry for endoscopies and other similar procedures. Held by the Dextre robot and commanded from the ground, VIPIR worked through its on-orbit checklist during its operations. 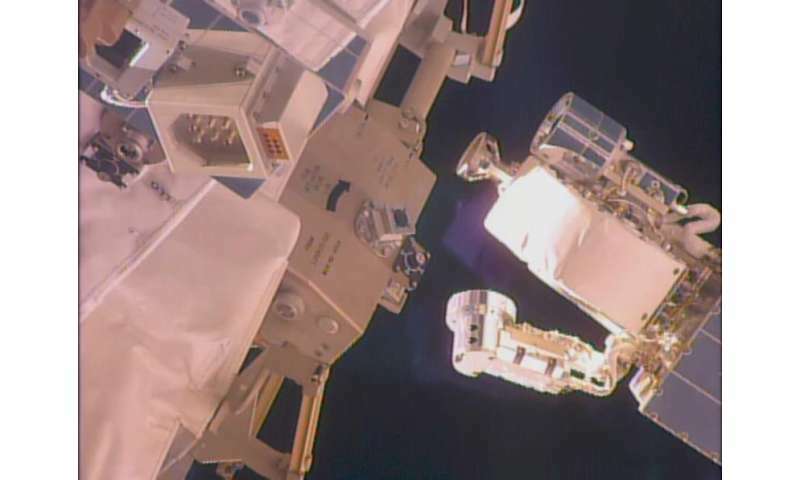 First, it used its zoom lens to capture images of RRM hardware and the space station. VIPIR's borescope camera also captured imagery as it worked its way through an obstacle course on an RRM task board, like a snake burrowing through a nest. In the end, VIPIR operations were declared a success. Collected data, now under analysis, will help the RRM team determine what type of camera system and operational techniques would be best suited for different tasks on potential future missions. "Doing RRM on the ISS gives us a controlled, representative environment to evaluate new technologies, gain invaluable experience, and get the type of data that help inform future efforts," says Reed. For example, the team detected resolvable image motion during the motorized zoom lens operations, which had not been present during ground testing. Before VIPIR opened its eyes in space, another RRM-hosted experiment also saw the light of "day" during its transfer to the RRM module. A set of advanced solar cells, mounted to one of the new RRM task boards, was exposed to the space environment to provide data on how these energy-generating packs perform in space conditions. The RRM team hosted this experiment on behalf of the Photovoltaic and Electrochemical Systems Branch at the Glenn Research Center. "We're very happy with the RRM results to date," says Jill McGuire, RRM Project Manager," and we're excited to see what RRM unlocks for NASA and the satellite community." With these two demonstrations complete, the RRM team is taking a breath before they plunge into the next set of operations, occurring later in 2015. Using the two new task boards, the RRM team will demonstrate technologies and procedures that could be used to prepare a spacecraft for cryogen replenishment. They will also practice making the types of electrical connections that would be needed to install plug-and-play satellite instruments. "Step by step," says Cepollina, "these technologies are building essential capabilities that, in turn, equip us to boldly build and maintain a robust space infrastructure. Keep on watching RRM on the International Space Station. There is more to come."